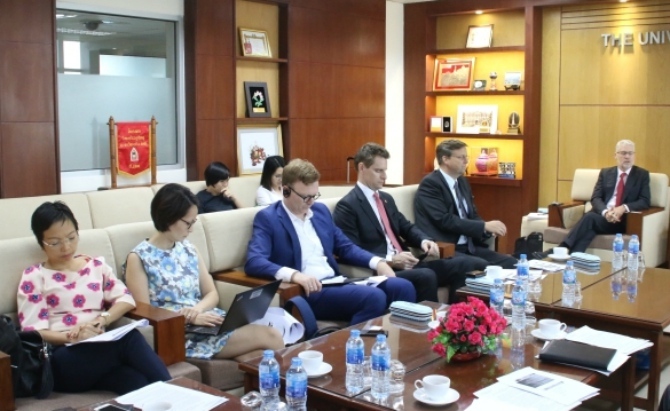 On October 5th, 2018, a joint delegation of the Swiss State Secretariat for Economic Affairs (SECO) and the World Bank (WB) co-led by Mr. Steffen Milner - Program Manager, in charge of Vietnam at SECO Head Office and Dr. Sebastian Eckardt – Lead Economist of the WB in Vietnam visited and worked with the University of Danang (UD). Other members of the mission include Mr. Marcel Reymond – Head of SECO office in Vietnam and Dr. Marc Laurence Robinson – Chief Technical Advisor (CTA) of the Vietnam Public Financial Management Analytical and Advisory Assistance program (AAA Program). The UD’s attendants were Assoc. Prof. Nguyen Ngoc Vu – President and other senior representatives. At the meeting, the delegation of SECO and the WB were informed of the overview, orientation and solutions to the overall development of the UD up to 2025 with a vision to 2035. 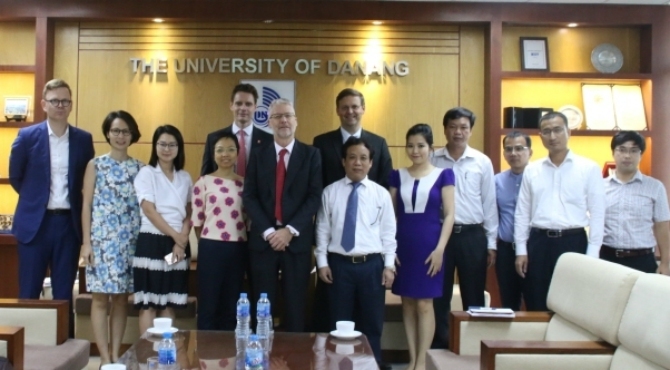 The content of the presentation focused on R&D achievements and significant technology transfer activities of the UD, including research programs that serve the socio-economic needs of Danang city and other provinces in the Central and Central Highlands of Vietnam. On this occasion, the UD have proposed a 100 million USD loan from the WB to invest in the construction and technical infrastructure of a new UD campus in Hoa Quy - Dien Ngoc. In addition, the University also expect SECO to support their efforts to implement science and technology projects and the program "The development of advanced digital technology for smart city” applied in Danang. The theoretical foundation of the "smart city" program has been deployed by the UD, McGill University (Canada), the University of Akron (the USA), the University of Newcastle (Australia) and the French National Research Center through FIRST project, which is funded by the WB since March 2018. On behalf of the delegation, Dr. Marc Laurence Robinson - the CTA of the AAA Program - gave special thanks to the UD for its active cooperation, interests and support. The Program, which is funded by SECO and Global Affairs Canada (GAC), aims to support Vietnam’s efforts to reform its public financial management at the central and local levels. It has been working with the Ministry of Education and Training to develop Key Performance Indicators for universities. During the meeting, Dr. Robinson expressed his expectations to receive effective support and participation of the UD in piloting the indicators and potentially piloting output-based budgeting in line with the State Budget Law at the university. The delegation noted the proposals made by the UD and informed that they would convey them to relevant departments of SECO and the WB for any possible coordination in the future. At the end of the meeting, Assoc. Prof. Nguyen Ngoc Vu, President of the UD highly appreciated the support that SECO and the WB have provided to the UD and hoped to receive more effective assistance in the upcoming time. Regarding the AAA program, the UD affirmed to continue cooperation and participation in relevant activities to achieve program goals.